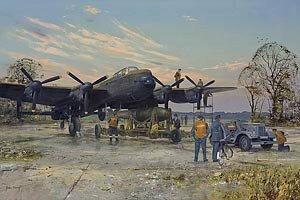 overall size 22" x 15½"
Towards the end of the war, the almighty ‘Grand Slam’ bomb was brought to the front line. Handled by 617 Sqn. it saw use in several theatres of war including destroying the Tirpitz and submarine pens. At 22,000lbs was very much the largest conventional bomb ever used. My print depicts a loading scenario, runways looking tired, aircraft looking quite new, with a small problem to be attended to at the tractor end. The loading operation was a precision task and had to be inch perfect. To facilitate this requirement the rear wheels of the trolley had to turn as well as the front ones. The rear wheels are in fact locked over to align the bomb correctly.